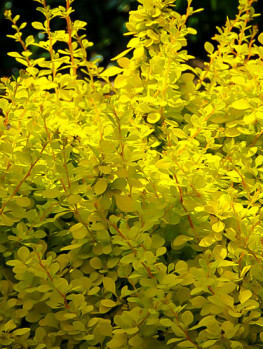 The Lime Glow Japanese Barberry is an attractive shrub with stunning golden to lime-green foliage in spring and summer. In fall the leaves turn brilliant shades of red, lightening up the garden. The lime-green foliage is a bright background for other plants, or a feature on a plant grown alone. All colors are improved when seen alongside this charming color. 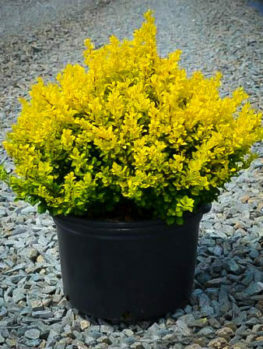 Unlike older varieties of Japanese Barberry with golden leaves, this form will not burn and become unattractive in sunny locations. Plant it among other medium-sized shrubs, or as part of a collection of drought-resistant plants. 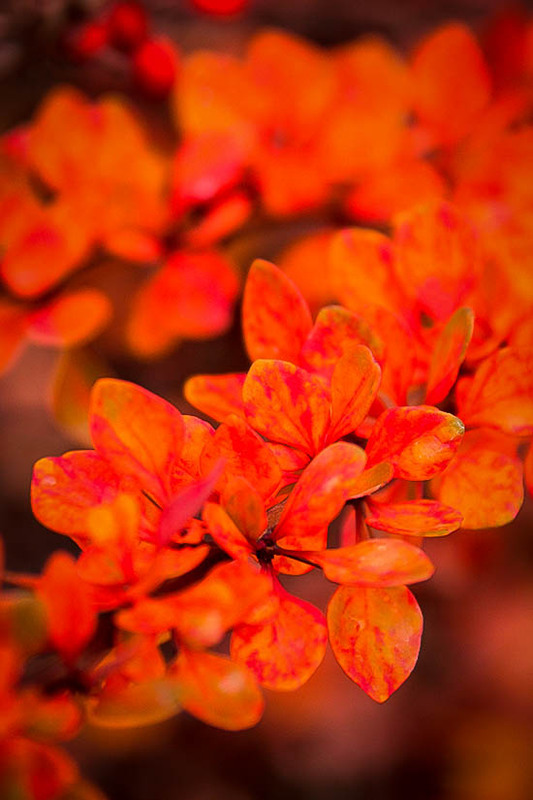 It can also be planted in a row to create a colorful and intruder-proof hedge. 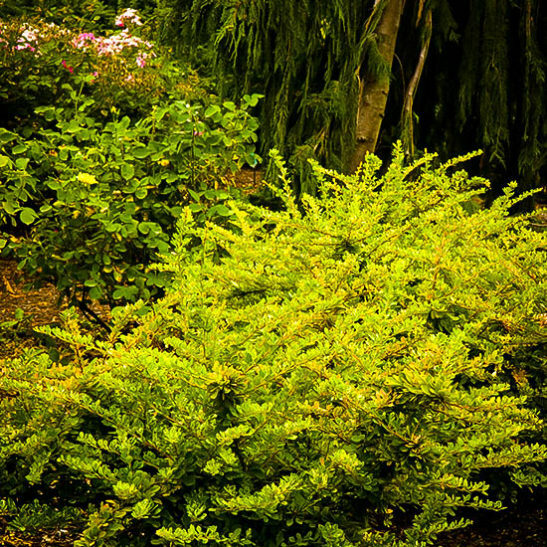 Plant the Lime Glow Japanese Barberry in a sunny or partially-shaded location. The strongest color develops in full sun. It will grow in a wide range of soils, although not in wet ground. Once established it will tolerate dry and neglect. This plant is very hardy right across the country, grows well in poor soil and dry conditions and it is pest and disease free. Even deer avoid the thorny stems, and these also give added security around your home. One of the most fashionable garden colors for several years now has been lime-green. This vibrant color simultaneously blends in with the normal greens of most plants, and at the same time stands out and creates an eye-catching highlight. Like the natural green it is related to, all other colors look wonderful mixed with it, which is part of the reason for its great popularity. Such a versatile color has been developed for many plants, and if it is found in a tough, hardy, trouble-free plant, what is not to like? 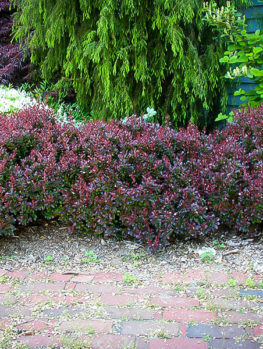 The Japanese Barberry is a justifiably popular garden plant, already available in several foliage colors, such as purple, red and pink. 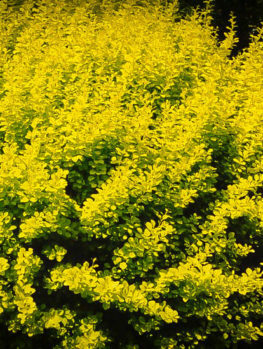 There is an older variety with yellow foliage, but it is hard to grow well because its new leaves often burn in the spring sunshine, making it look very unattractive. 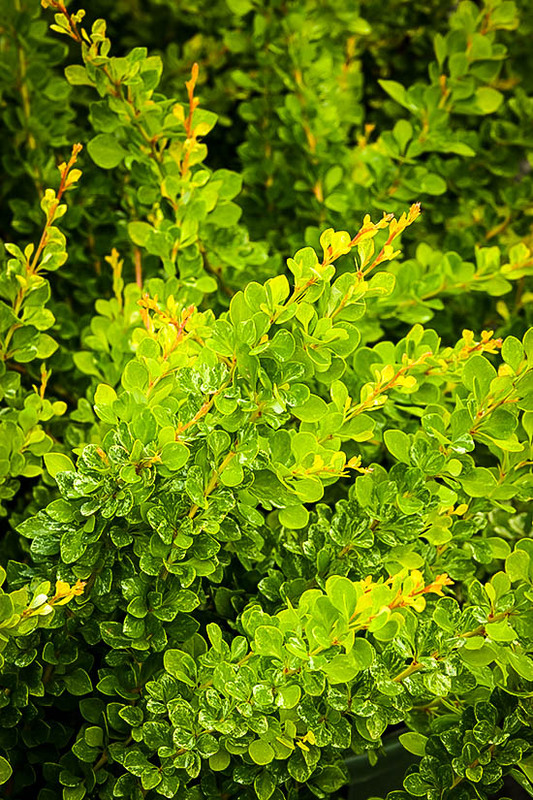 Now we have the Lime Glow Japanese Barberry, with golden leaves in spring that have just a tint of green – enough to protect them from that harsh sun and keep your plant looking great. From stunning lime-yellow in spring, the color gradually fades to a vibrant lime-green by summer. 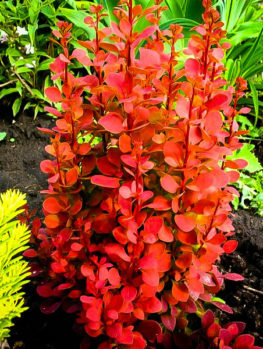 Then in fall this plant makes a spectacular comeback, and the leaves turn eye-catching shades of red, glowing like a beacon in your garden. The Lime Glow Japanese Barberry is a deciduous shrub that grows between 4 and 6 feet tall, and 3 to 5 feet wide. It has arching branches and a dense, bushy structure. The stems have a sharp spine beneath each cluster of leaves, and while this means you should keep this plant away from spots where people must brush by it, it also makes this a great security bush. Planted beneath windows, or as a hedge, no-one is going to push through it – and that includes deer, who avoid this plant even in the depth of winter. As soon as the new leaves appear in spring in all their golden glory, clusters of small, yellow flowers form, although these may not be noticed. Over the summer they slowly develop into berries, and suddenly, when those spectacular fall leaves drop to the ground, bright red berries are revealed, which brighten the winter garden for months. Plant your Lime Glow Japanese Barberry in a sunny or lightly shaded location. The best leaf colors will develop in full sun. It is hardy to minus 30 degrees, and it will also grow well in all but the very hottest parts of the country. There are very few parts of the country where this plant is not reliable, hardy and easy to grow. Water your new plants well during the first year, but once established it will tolerate drought well. 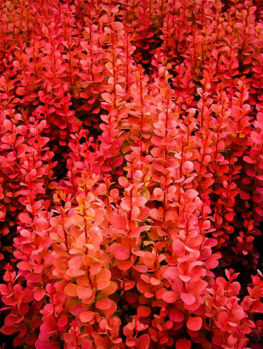 All this wonderful seasonal color does not mean this plant needs a lot of care – in fact, the opposite is true. 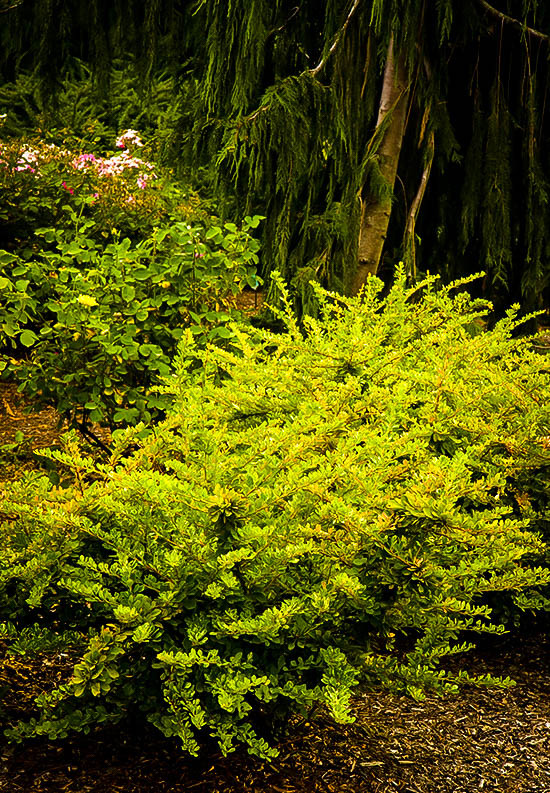 The Lime Glow Japanese Barberry will grow in all kinds of soil, from sand to heavy clay. All it asks for is a sunny spot to develop the best foliage color, and good drainage. It will not grow well in wet soils or deep shade, but it is very drought tolerant once established. It is also free of pests and diseases, and we already mentioned that deer don’t eat it, but such good news bears repeating! It can be grown as a specimen, or planted in a row to make a sturdy low hedge. 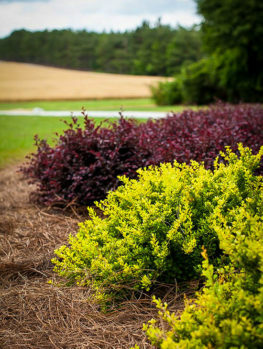 Planted in groups among other plants, including other varieties of Japanese Barberry, you will have color in your garden for every season of the year. Japanese Barberry (Berberis thunbergii) was first grown in America in 1875. The well-known Arnold Arboretum in Boston brought it from China and Japan where it grows naturally. It quickly became very popular as a hardy garden plant, and in time many varieties with colored leaves were developed by gardeners. At the Tree Center, we offer a wide range, from the purple foliage of ‘Crimson Pygmy’ and the orange-reds of ‘Day Break’, to the stunning pink of ‘Rose Glow’. Placed around your garden, these plants bring lots of vibrant color for no effort at all. We do not know the origin of the variety ‘Lime Glow’ but it seems to be closely related to ‘Rose Glow’, so it could have come from the Dutch nursery area of Boskoop, but we do not know this for certain. Equally it could be related to the older American variety ‘Aurea’. Whatever its origins, our plants are grown from stem pieces of the correct variety, so you can be sure that you will receive the real thing, and not cheap seedling plants of unknown origin and variable growth.